A few weeks ago I made a trip to Nashville to learn more about new products from White Lily and Martha White. 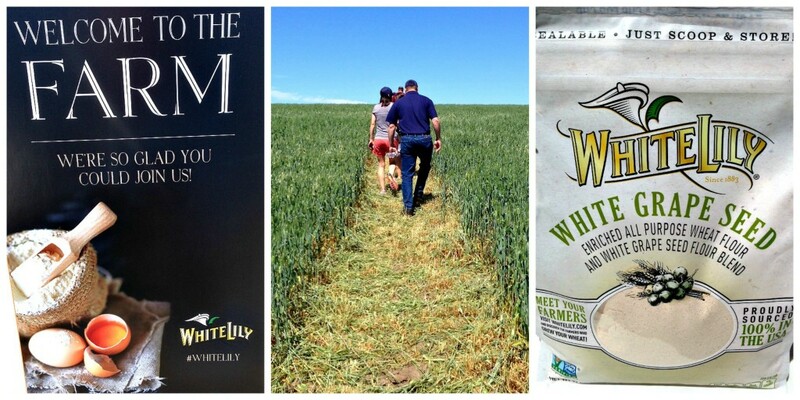 Earlier in the year I had the pleasure of attending the product unveiling for While Lily’s new premium flour blends. You can read about that trip here. The new line of flour from White Lily comes in 3 varieties: a Wheat and White Grape Seed Blend, Wheat and Red Grape Seed Blend, and All-Purpose Wheat. All 3 can be subbed for wheat flour in any recipe and they give baked goods an amazing texture and taste. The wheat for the flour is being grown in the Pacific Northwest by Shepherd’s Grain. On the back of each bag of flour there is a number which you can type into White Lily’s website to learn the names of the farmers who grew the wheat in your bag of flour. I love this whole concept of connecting the food we eat to the people who grew it. And I am so in love with the resealable bags the flour comes in. These new flour blends can currently be found in many Target stores across the country. 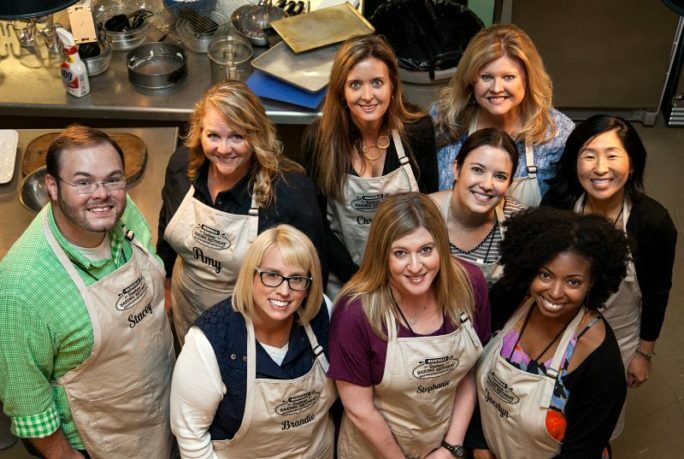 I was joined in Nashville by some of my favorite bloggers: Alice from Hip Foodie Mom, Amy from She Wears Many Hats, Brandie from The Country Cook, Jocelyn from Grandbaby Cakes, Lindsay from Love and Olive Oil, Melissa from Melissa’s Southern Style Kitchen, Stacey from Southern Bite, and Stephanie from Plain Chicken. 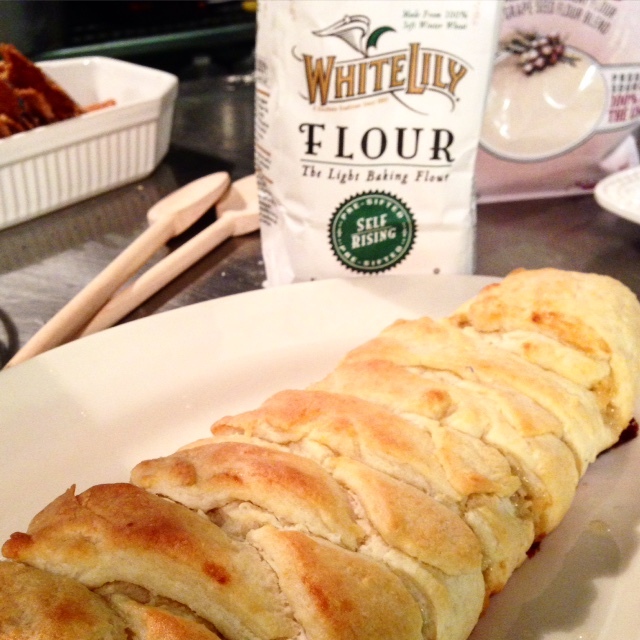 The first day we were paired up to make recipes featuring White Lily flour. I had the joy of making a Coconut Almond Braid with Melissa. It turned out amazingly well and I can think of many variations of it to do. It had that magnificent tender and light texture that only White Lily flour can produce. 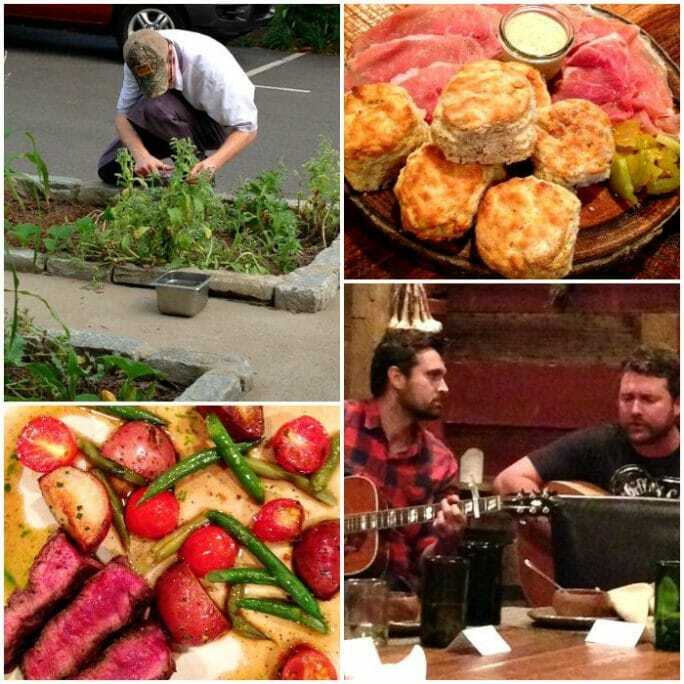 That evening we were in for a very special treat- a private dinner at Husk Nashville. I had eaten before at Husk in Charleston so I knew it would be a meal to remember. We were served course after course of amazing food followed by entertainment from J Michael Harter. I have to say that my favorite food was the Biscuits made with White Lily flour served with very thinly sliced country ham. The next morning was all about Martha White. We got to sample Martha White’s new gluten-free muffin mixes which come in 3 flavors: blueberry, double chocolate, and corn muffin.And there is also a new sweet potato muffin mix. I’m a huge fan of sweet potatoes so I was super excited to see they had added a sweet potato flavor. If you’re a sweet potato fan too, you’ll have to take a peek at Brandi’s and Stacey’s Mama’s Sweet Potato Cake with Marshmallow Buttercream Frosting. It looks insanely good doesn’t it? We were again paired up and given the task of creating a recipe using Martha White muffin mix insipred by a country music song. Lindsey of Love and Olive Oil and I had the song “Devil Went Down to Georgia” and we used Martha White’s Chocolate Chip muffin mix, cocoa powder, melted chocolate chips, coffee, and peanut butter to make Devilish Brownies. 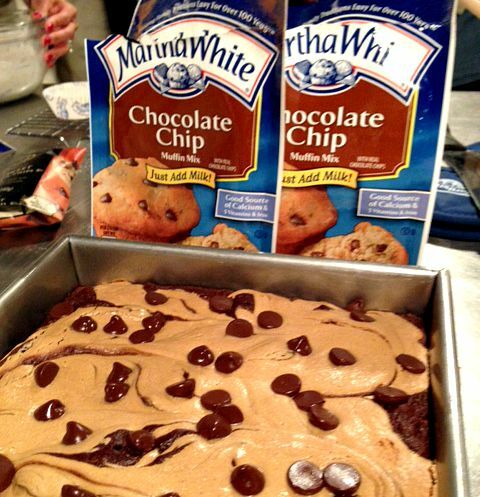 The whole activity really brought home the idea that there are so many things you can make with Martha White muffin mix besides muffins. Did you know you can even make waffles with them? We also got to sample the winning recipe from the 2015 National Cornbread Festival cooked by none other than the winner herself, Karen Shankles. 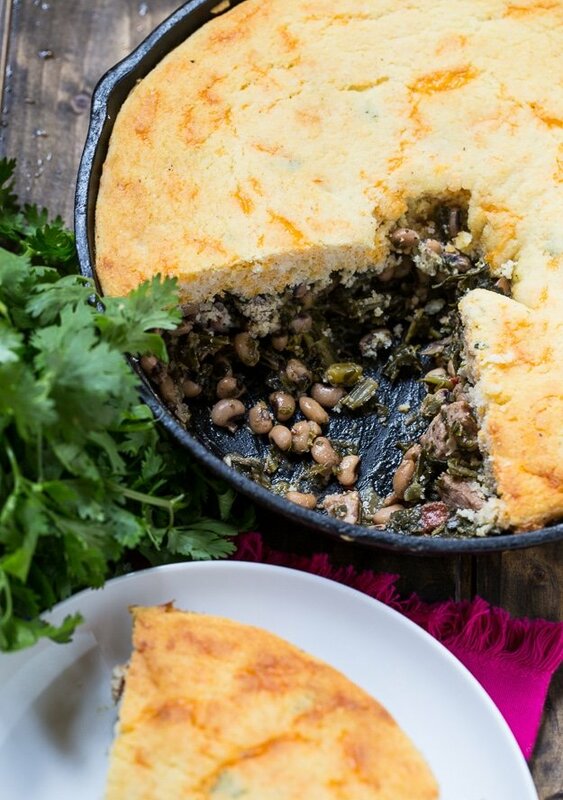 It’s a one-pan cornbread skillet with black-eyed peas, collard greens, and smoked sausage. Southern comfort food at its best and so easy to make for a weeknight family meal. A big thank you to the wonderful folks at White Lily, Martha White and DVL Seigenthaler for hosting such a wonderful event! 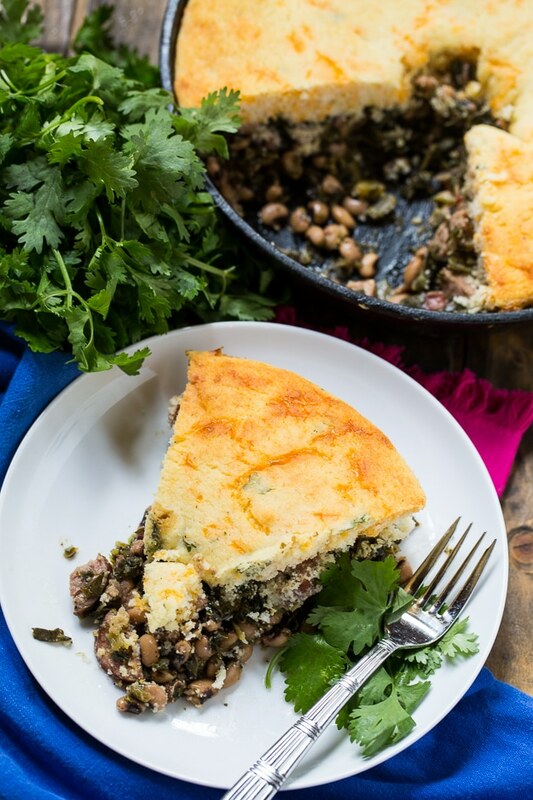 This cornbread skillet is a delicious, one-pan southern meal with smoked sausage, black-eyed peas, and collard greens. Heat oven to 400 degrees. Cook sausage, onion, and bell pepper in a 12-inch cast iron pan until sausage is brown and onion and bell pepper are softened. Add garlic and cook for 30 seconds. Stir in remaining filling ingredients, EXCEPT cilantro, and simmer for 10 minutes. Add cilantro. Place the cornmeal mix and sugar in a medium bowl. Stir in buttermilk, egg, and oil. Fold in cheese. Spoon batter over sausage mixture leaving an area open in the middle (it will cook more evenly this way). Place in oven for 30 to 40 minutes, or until cornbread is lightly browned. If you don't like cilantro, sub parsley or leave it out altogether. Pinto beans can be used instead of black-eyed peas. Feel free to add more smoked sausage. The original recipe called for a 16-ounce package, but I happened to have a 12-ounce package. Recipe slightly adapted from 2015 National Cornbread Festival winning recipe from Karen Shankles. This entry was posted in General and tagged Collard greens, Cornbread, Martha White, white lily. Bookmark the permalink. We have now made this dish twice. Love it! Plan on using every kind of bean in future dishes. I made this dish even though I am not a fan of collard greens. I absolutely love it. A week after preparing it, I found myself craving the Festive good Luck Cornbread Skillet so I made it again. This time, I topped the cornbread with the cup of Cheddar Cheese I had left over. A delicious, nutritious, skillet casserole is the only way to describe this dish. Your trip sounded like so much fun 🙂 Such a great experience! This cornbread looks SO good! I love how hearty and flavorful the filling js! What a fun experience you had! Looks like you guys had a total blast! And this cornbread? You kinda knocked it outta the ballpark. I am a total cornbread-FIEND so this is right up my alley! Wow! What a great event! Looks like you guys had loads of fun! Not to mention good eats! And boy does that cornbread look amazing – I can honestly say I’ve never had cornbread with filling like this – I’m clearly missing out! De-lish! What a great event! It sounds like so much fun! 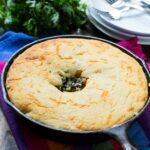 This is a fantastic cornbread that is full of southern goodness! Sounds like you had a great trip, that sounds fun! I’m a huge fan of cornbread, so this dish sounds delicious. I love the filling too! Pardon my yankeeness, but I’ve never seen cornbread with anything inside. Now I really want to try, looks good! That looks like so much fun! I’m totally jealous! I love that this cornbread is a meal in itself! 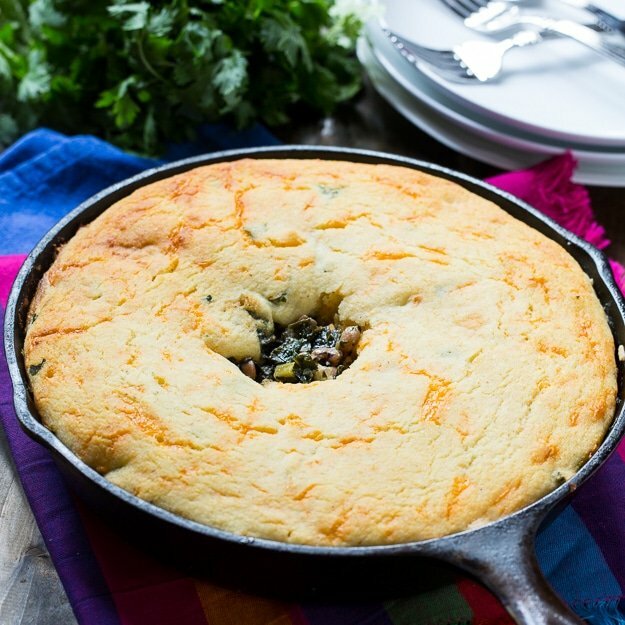 I love how you turned cornbread into more than just bread! I could almost have this for my main course! Sounds like you had an amazing experience, Christin! And this cornbread sounds delicious! I love making it in a skillet, gives it so much flavor. Your version looks just perfect!